What is Papercutting / Scherenschnitte? Scherenschnitte, from the German “Schere” for scissors, and “Schnitt” for cut, is the traditional craft of cutting paper with scissors or a knife. It often features a silhouette or a scene using a delicate and intricate process requiring an immense skill and meticulous attention to detail. In France it is also called Découpage or Silhouette. Paper cutting finds its origins in Northern China where it was used to form stencils to decorate fine silks. Most likely, the technique found its way to Europe in the early 17th century through trade with Asia. The first decoupage found in Germany is from 1612. 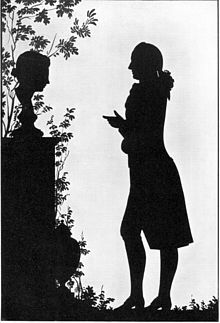 During the 19th century, paper cut portraits became very popular and even the famous poet Goethe had a few made for his close friends. 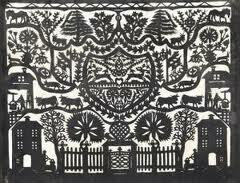 It is told that paper cutting spread in rural Switzerland, as this hobby helped filling long winter nights. Cutting then was performed with scissors, knifes and even sheep shears. The designs featured landscapes of cows, goats and herdsmen and illustrated the movement of animals up to the mountain pastures and back. The best-known artist that made these traditional folk cuttings in Switzerland was the son of a farmer, Hans Jakob Hauswirth (1809 – 1871). Many modern paper cutters still follow this traditional style. Decoupage permanent exhibition at the Musée Chateau d’Oex close to Gruyere. “Scherenschnitte. Papiers découpés. Silhouette. Paper cuts.” It is the eighth Swiss paper cut exhibition and could be seen in the Schwyz branch of the Swiss National Museum then in Chateau de Prangins near Nyons in 2014. More recently, Maison Cailler, famous chocolate brand owned by Nestlé, featured Swiss artist Ueli Hofer Scherenschnitte artwork on special edition boxes. Negar, mum of two and founder of couPure Art, found the local art of scherenschnitte very appealing and romantic. Her idea was to use this traditional craft in a more contemporary way to decorate baby and children rooms. In fact, the softness and subtlety of the original patterns featuring birds, flowers and romantic themes lends itself to all that expresses love like weddings or birth occasions. couPure Art designs personalized wall arts for kids rooms, wish cards, birth announcements and wedding cards. To make each wall art unique yet affordable, Negar chose to have it laser cut in a workshop near Zürich and adds her own hand cut finishing touches to make sure each wall art is perfect. You can now personalise your decoupage art with a choice of background colours, theme as well as with names, important dates or meaningful quotes. couPure Art makes the perfect Swiss style personalised gift or card with a modern twist that your loved ones will keep forever.